Hyoliths are rather common in some rock sequences. They are among the earliest shelly fossils known, found in the lowest Cambrian rocks (about 540 million years old). They peaked in abundance in the Cambrian and lived throughout the Paleozoic Era, finally going extinct at the end of the Permian Period (around 250 million years ago). 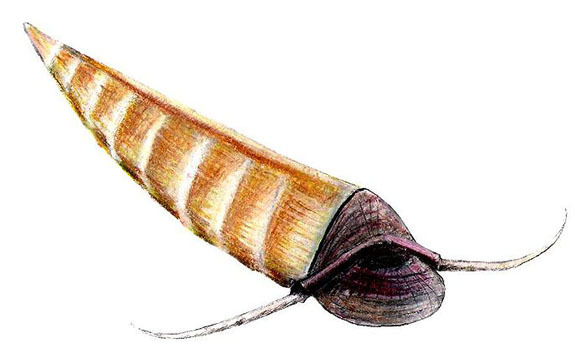 Reconstruction of a living hyolith (by "Smokeybjb" via Wikipedia). For as many hyolith fossils we have, they remain an enigmatic group. They had conical shells, usually a bit flattened, with a hinged lid (operculum) over the open end. 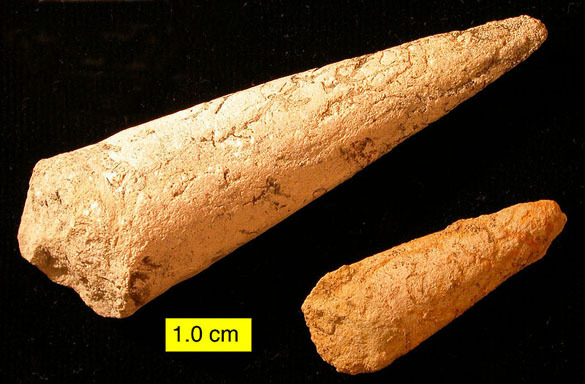 Extending from the space between the operculum and cone were two calcareous rods called helens (a name deliberately chosen so as not to evoke a particular function). Some rare hyolith fossils show evidence of internal features, including muscle scars and a twisted intestinal tract. We still can’t definitely place them in a particular animal group, though, and even their life habits are obscure. They probably were deposit-feeders (digesting organic material from seafloor mud), but the support for this is speculative. The hyoliths of Estonia tell us one more thing: they are different enough from other hyoliths around the world to show us that the paleocontinent of Baltica likely had its own biogeographic province. 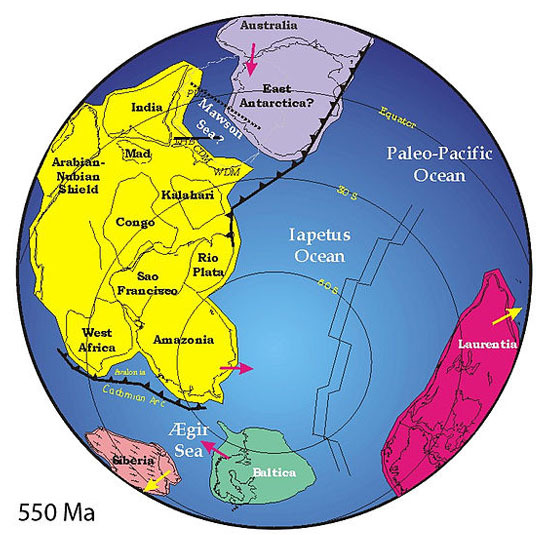 In other words, Baltica was isolated as an island continent during the Middle Ordovician (around 460 million years ago), much like Australia today. Baltica is the small green continent shown on this global reconstruction of the Cambrian (public domain from Wikipedia). That they are; those things are monsters! The ones from the Mid. Ord. of Laurentia that I find are only a few milimeters.